ACF Consulting Blog: Are you Still Not Backing up your Data? Are you Still Not Backing up your Data? You should know by now that computers are not perfect. They can fail, and if you’re not backing up your data, it can be lost, and sometimes it cannot be recovered. Data loss can be catastrophic to a business, but the good thing is that it is preventable. All you have to do is back up your data. If it’s that easy, why are so many businesses not backing up their data? Many people are unsure about what they should back up or the best ways to do it. The below post will answer some of those questions. You should back up your data in order of what is most important. Think about the things that you would be lost without and make them the top priority. Things like customer databases and payroll records should always be backed up. Could you imagine how lost you would be without this information? There are several different backup methods, but we recommend online data backup because it is very secure, automated, and managed. With online backups, you don’t have to worry about finding a place to store your data or scheduling time out of your day to back up (two reasons people neglect to backup in the first place). If you do need to recover data, it is easier to recover data than some other methods. 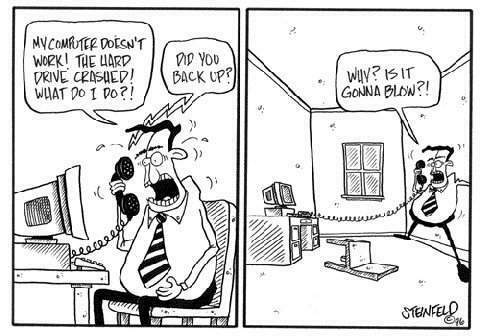 Online backup is an easily and reliable solution. When it comes to computers, bad things can happen and if you aren’t taking precautions, those things could cause you a lot of headaches. Data backup is one of the simplest ways to make prevent a catastrophe and should be done by all businesses. If you aren’t backing up your data, you could be risking a lot. Are you willing to take that risk with your business? To learn more about the online data backup, or get information on how to get it for your business, click here.